The Party of Regions on Saturday urged "all citizens, all political forces and non-government organizations of sound judgment to stand up for safeguarding the constitution, rule of law and public order." "This is the only way to stop the escalation of violence and put the whole process in the framework of peaceful negotiations," the Party of Regions' faction in parliament said in a statement. The faction mentioned that European Union leaders and political parties in EU member countries urge the Ukrainian government to start a dialogue with the opposition to find a solution to the crisis. "This is what we have been always standing for. 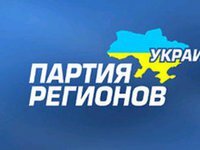 The chairman of the Party of Regions, Prime Minister Mykola Azarov, has put forth such an initiative. We have proposed that our political opponents return into the constitutional framework, and we stand ready to appoint a team of negotiators to seek the normalization of the situation in the capital city. The opposition must traverse its own path of the way: it must stop picketing administrative buildings, isolate the provocateurs, and pacify the demonstrators," the faction said. This position "was stated clearly during the session of the Ministerial Council of the Organization for Security and Cooperation in Europe and was understood by its participants," the statement said. "We have stretched out our hand to the opposition." "However, what do we have in return? The picketing of administrative buildings is going on, which is making it difficult for the government, the National Bank and the presidential administration to perform their duties. Who can we have a dialogue with? With those who call for occupying administrative buildings and for assaulting police?" the statement said. Police officers injured in clashes with demonstrators "say unanimously that they personally and their families have been receiving anonymous threats," it said. "There have also been attempts to intimidate and blackmail Party of Regions deputies – they have been receiving phone calls and threatening SMS messages." "These are not reconciliation proposals but demands that are coming from the Maidan [Kyiv's Independence Square, the main site of current protest rallies] for creating a 'black book of traitors and human rights violators in Ukraine.' The extremists have gone beyond the boundaries of humanity and morality when they started threaten to do bodily harm to families of law enforcers and politicians, judges, and police officers who have taken part in investigating all illegal acts during street rallies," the faction said. "It is obvious that the attempts to intimidate law enforcers are designed to derail the process of identifying and punishing those guilty. Opposition leaders are doing nothing to put an end to out-of-court punishment attempts," it said. "We assert resolutely that we will not be intimidated. We demand that law enforcement agencies investigate and strictly cut short any instance of threat against certain people," the faction said.